Going Green? See our Green Building options! Powerbilt offers you four different types of metal storage sheds to choose from. These models have been constructed with the highest quality and, heaviest gauge maintenance free commercial U.S. steel. We are especially proud of the fact that our metal storage sheds are made right here in the U.S.A. Their precision manufacturing and design meets or exceeds industry standards. Each metal shed kit includes an assembly manual that is easy to follow, ensuring ease of construction.The P Series of metal sheds offers a more traditional building style with straight sidewalls and arched roof. It is the arched roof which gives your unit the strength and durability that you can count on. This model optimizes useable space by raising the arch above the sidewalls. This provides you with plenty of room to house a backyard workshop, garage or even a guest cottage. Powerbilt P Series metal sheds come in unlimited lengths and either 14 or 30 foot widths. Our metal storage sheds are available in three colors, and can be customized to match the outside of your home. Our new A Series steel shed enjoys the same tested engineering as our P Series steel sheds. The appeal of this shed style lies in its 4 to12 pitch roof, which offers perfect protection for your workshop, storage, or garage space in high wind and snow areas. The A Series of steel shed is available in three different colors and in 20 to 40 foot widths. 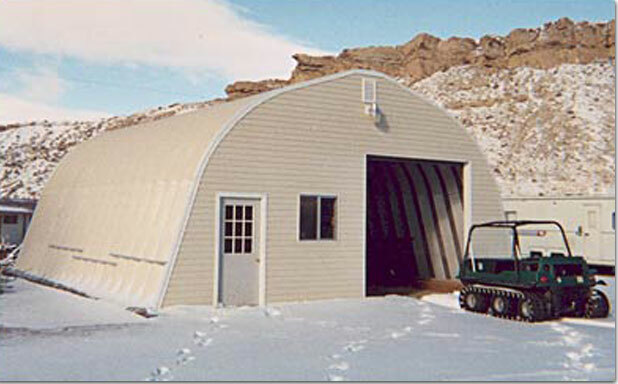 Powerbilt Q Series arch style steel buildings, otherwise known as Quonset huts, were named for the town of Quonset, Rhode Island, the site of the U.S. Naval base where these steel sheds were constructed during World War II. 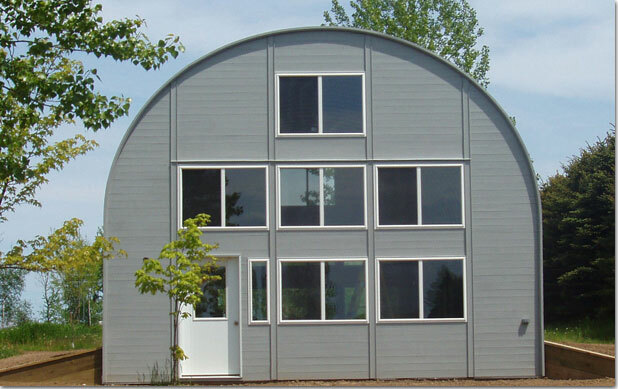 These classic Q Series steel sheds provide unbelievable strength as the rounded shape of their corrugated arch is one of the strongest structures in architecture; they have been proven to withstand hurricanes, tornadoes, earthquakes, and heavy snow. Without beams or trusses, Powerbilt Q Series steel sheds offer 100 percent useable space and are ideal for uses as diverse as grain storage, backyard workshops, and airplane hangars. Model sizes range from 20 to 80 feet in width and come in unlimited lengths. S Series style steel sheds offer high, straight sidewalls and a curved arch roof that sheds heavy rain and snow with ease. High sidewalls mean more usable vertical and floor space; in fact, this design provides 100 percent useable space and is a proven favorite for small manufacturing, commercial and industrial purposes, recreational vehicle storage, fire stations, and airport fueling stations. Model sizes range from 10 to 50 feet in width and come in unlimited lengths.